Interactive Donor Walls utilize a touch screen monitor to guide a viewer through menus that are created much like a website menu system. Very intuitive, and allows a whole host of options such as Donor Stories, Video, Annual Fund Donors updated via excel spreadsheet, news feeds from campus websites, weather, Faces of Philanthropy and any other idea that you can think of. Posted on August 23, 2013 by rcbawards Tagged digital donor wall buying processdigital donor wall RFPwhy buy electronic donor wall	CommentsNo Comments on Do we really need an electronic donor wall? Do we really need an electronic donor wall? What is the digital donor wall buying process? Do you have an existing donor wall? What is the cost and time to do so? Do you need an interactive donor wall? What will an interactive donor wall do for you that your current donor wall does not do? We hear from institutions that feel that their current wall had become dated, that it was too difficult to maintain and update every year, that they want to control costs better, that the wall needed to tell donor stories of why philanthropy was important to them and not just have a wall that was a list of names. Usually the biggest reason is that the updating of static walls is time-consuming and expensive. Often, these walls go for years with no updates because staff just doesn’t have the time to do it. Additionally, an interactive donor wall serves as a marketing tool for new donors, and offers the ability for donors on the spot to get in touch with the donor relations staff. Who should be involved in the decision-making process of selecting a digital donor wall? IT – They must have input even if they want a hands off approach. Network connections will be required and often RSS feeds, calendars and data from network systems are asked for. Facilities and Project Maintenance – They will be involved in the installation and possibly cabling. Marketing – This digital display is part of your organizations branding and must be consistent with the look and feel of the organization. Graphics Design – Like the building of a website, graphic design is an integral part of the display. Public Relations – They will want to see how the organization is portrayed and will have valuable input. Procurement – Typically, they will oversee the contracting and can help with the RFP and implementation. The most important criteria are what are best for your organization. What works for one university or hospital may not be right for you. Do what’s best for you. Ask lots of questions, visit as many sites as you can. Try to see as many displays as possible, so that you have a good idea of what is out there and what you like. The worst thing you can do is tell a vendor, “I don’t know what I want”. You’ll be overwhelmed with information and in the end probably not fully realize the system to all of its capability. How will this donor wall help to improve your fund-raising goals? How do you plan to use the electronic donor wall? Be specific about how many donors you have, who they are and what categories you place them in. Identify all the campaigns clearly: Capital, Annual Fund, Endowment, Elevator Addition, etc. How do you expect to interact with the maintenance of the digital wall? A standard template that uploads in a specific fashion, or a custom interface that loads data exactly as you need it to? Be specific about expectations during development, installation and training. What do you expect after the project is done? Before you invest tons of time, have a ballpark idea of the costs for design/development of the wall, installation, maintenance, upkeep and annual subscription/support. A good digital donor wall is not just a monitor stuck onto a wall. It should be part of a comprehensive donor display with a hardscape to draw in viewers, tell the story of philanthropy in your organization, and is overall attractive and appealing. A short overview of how a custom Interactive Video Donor Wall works. A great presentation of the potential of an interactive video donor wall. Milwaukee-based RCB Awards recently released its interactive donor recognition wall for health care institutions, universities and other buildings to display and honor those who have donated to the organization’s efforts. According to Denevan, organizations in the Milwaukee area were asking for something more meaningful, more interactive and more engaging to tell their donor stories. “Video seemed like the logical solution,” Denevan said. The touch screen capabilities on the video screen allow visitors to select a donor by name to view their individual stories, but will also revert back to a ‘screensaver’ mode equipped with information about the foundation, organization or facility, Denevan said. Traditional donor recognition walls require continuous upkeep and management, Denevan said. With the interactive wall, the static name plates can be updated annually and the videos can be uploaded, edited or removed on an as needed basis, he said. RCB will even work with the organization hire someone to shoot the videos for them, he said. Displays can be integrated with video clips from donors themselves or photographs of what their donation was able to do for the organization, Denevan said. Denevan is talking with multiple organizations in the southeastern Wisconsin area about the installation of interactive donor walls, but also plans to work with organizations nation-wide because of the technologies remote capabilities. “This is where the future of large scale recognition is going. By allowing the user to see as much or as little information as they wish the display becomes more interesting to them and they become more engaged,” he said. To see a video of how the interactive donor wall works click here. 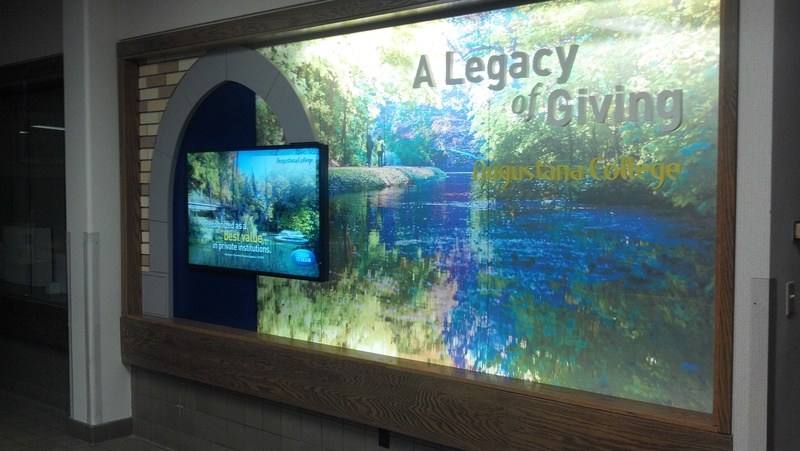 For more information on interactive donor recognition walls visit the RCB website.